So it had been my desire to visit this place for quite a while now. 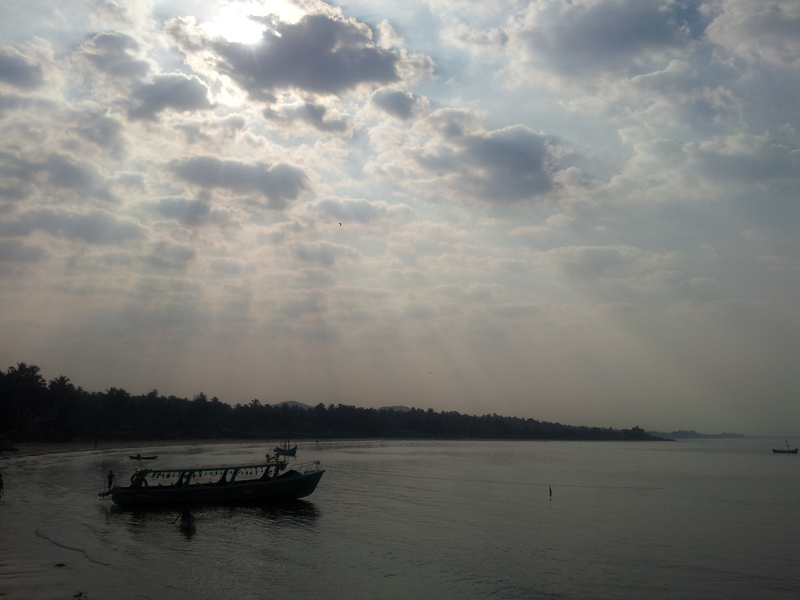 The last time I was near Murudeshwara was when I had stopped by over a long weekend, a ride taken to visit Gokarna. Too bad, I didn’t realize back then that it was hardly 70 kms from Gokarna. So I had made it a point to ensure that this visit happened this year. And thankfully, it did happen. 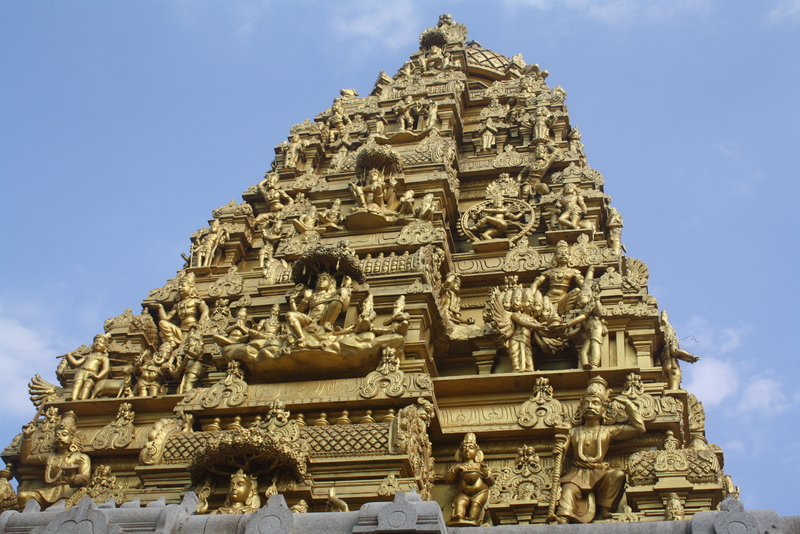 I had planned a trip in Karnataka, specifically off the locations that had interesting stories with regards to it’s grand mythological and historical references. A seed had been planted in my head, after reading Dr. Devdutt Patnaik’s books on mythology. I was all the more fascinated and had read two books of his on Lord Shiva. A belief doesn’t become stronger unless you have corroborated stories or beautiful understanding about any subject. That’s when I realized that this trip was going to be even better. A night’s journey in the Matsyagandha Express was smooth as I traveled sleeping like a log and woke up to realize Murdeshwar had already arrived at 4.30 in the morning. I had anticipated that I’d reach there early in the morning, but had not thought about what I’d do after reaching there so early. Having said that, as always, I tried my luck in the Railway quarters, only to realized there was one room available and there were a middle aged couple along with me who had to visit someone in the town and I decided to go into the waiting room and sleep some more before I headed to the temple. Fresh early morning cold with beautiful breeze certainly enchanted my mind and made me realize that my week long tour of Karnataka had already begun. After taking a short nap for an hour, I decided to stroll near the station and see what’s around. Silent as a grave, yet serene, the railway station was quite a beauty. 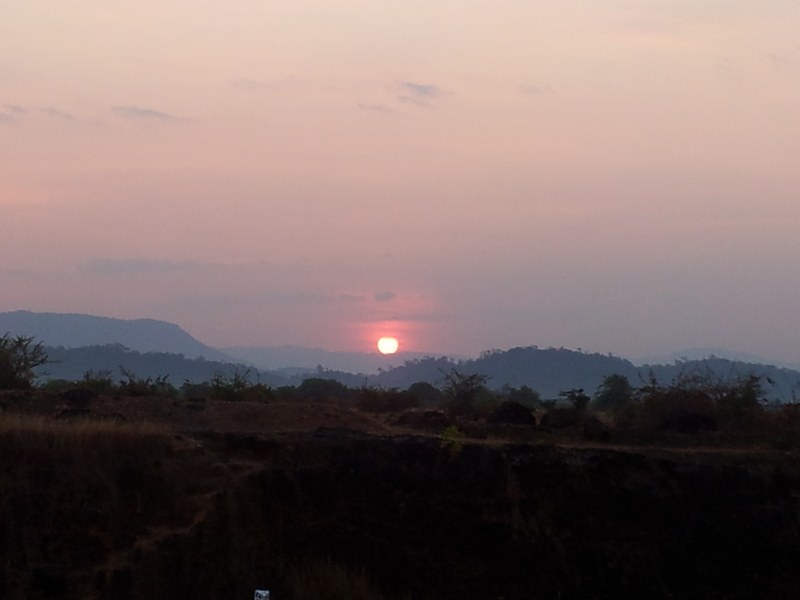 I decided to click some snaps of the sunrise which certainly gave solace to the mind. After freshening up, the best thing I could do is get a cup of tea and head towards the temple. But since I didn’t want to carry my backpack, I decided to keep it in the cloak room and come back in the afternoon and collect it. The problem was, my backpack, didn’t have a lock and they wouldn’t accept it. But thankfully, the railway employee suggested that I can keep the bag safe with the canteen guys and collect it later. I picked up my DSLR and my mobile phone with me, after which I didn’t have any valuables and I felt free to keep the bag with him. Nonetheless, the best part about travelling across South India, is that more often than none, you will encounter really amazing people who would help you out at each step of the way. While I approached the village and I could see the Lord Shiva statue’s head in the distant horizon, I saw a crowd that had gathered nearby. 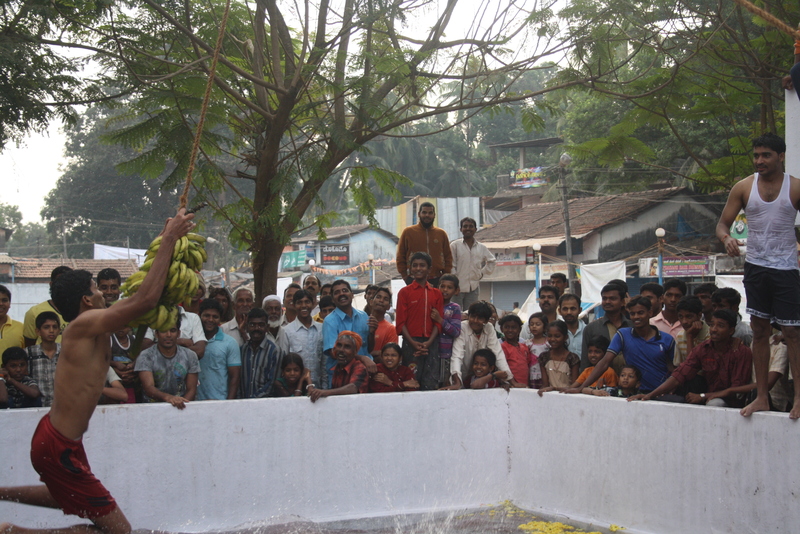 Just near a small tank near another temple, there was a group of onlookers to this interesting game of fetching the bananas. To begin with, there was a pulley on which a bunch of bananas were attached. On the edge of the tank on top of the wall, a group of young boys, decked with flower crowns waited their turn to jump in the air and try to bring down that bunch. While they tried their best to do so, the person who controlled the pulley tried his best to not let them have it. Enjoying this activity with a playful spirit others were cheering for these boys. While I’m sure there must be some significance, symbolic, religious or historic, when I asked around, very few knew what it was. All I got to know was it was a sacred activity performed by boys of the landlord’s family. My best guess is that these boys were entering into adulthood and this is a significant symbol of them trying to fight for the price catch (Metaphorical: A wife, materialistic life, food for themselves, responsibilities) well that was my best guess. There is a lift that will take you to the top most floor. All you have to do is pay 10 rupees and wait a bit with other people. 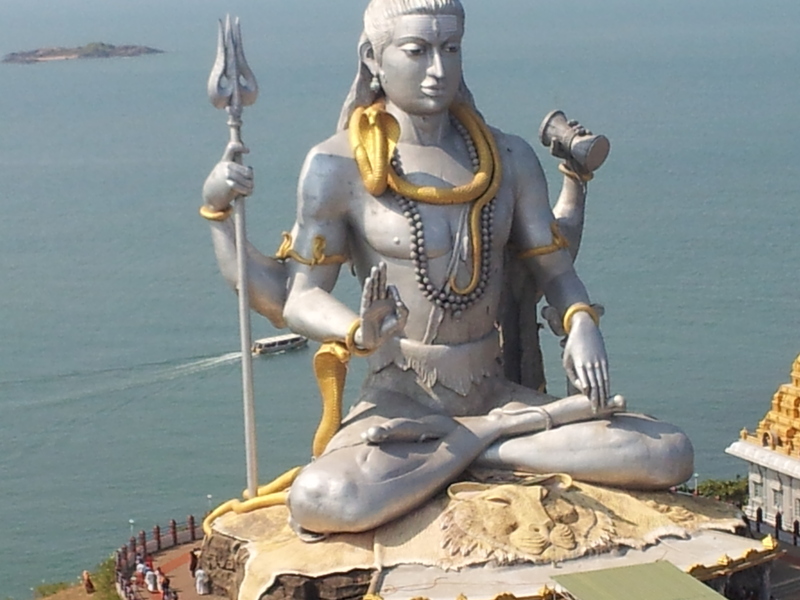 But once you go on top, you’ll realize that the wait is worth it… From the top, you can see the Lord Shiva’s Statue, which will give you the top view and that is also very enchanting, with the sea in the backdrop. After that, to get an up-close and personal view of Lord Shiva himself, I headed to the base of the statue, which has the cave, in which a description of the entire story of how Murudeshwara became a significant place in the context of Ravana, Lord Shiva and the Atma Lingam. 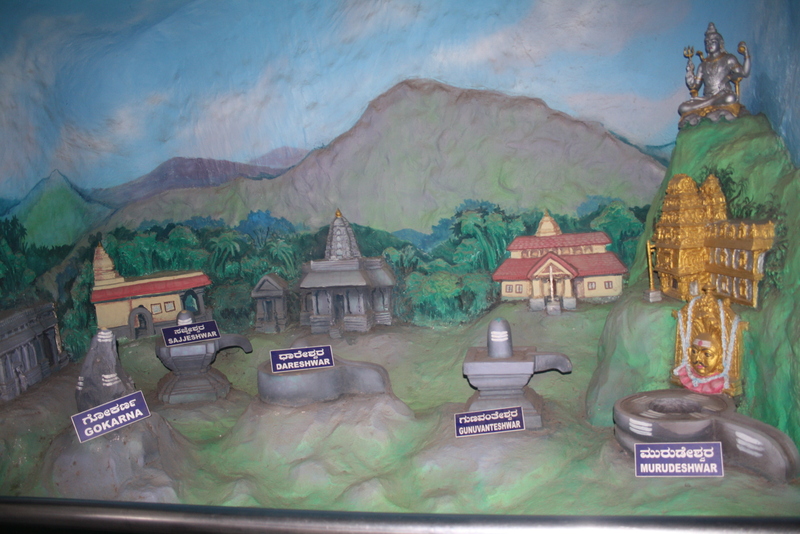 They also play an audio clip inside the cave, which tells you the story in Kannada and English if I remember correctly. 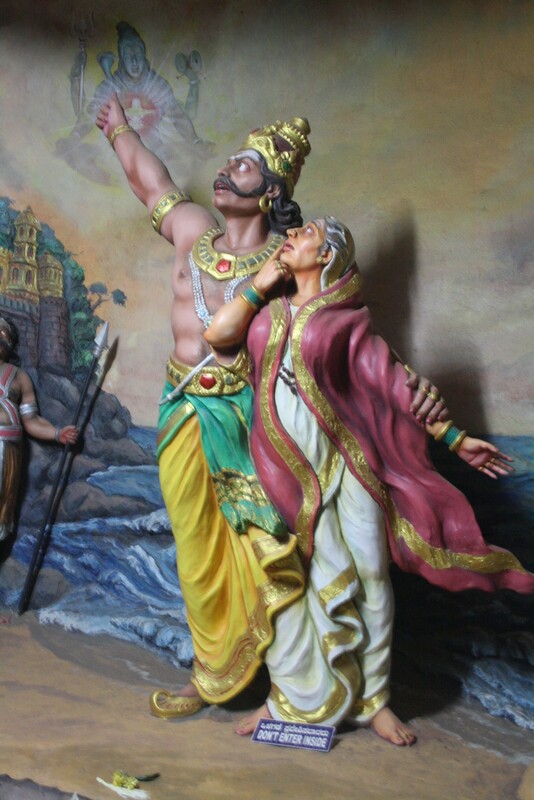 Ravana’s mom just like Ravana, was a stout devotee of Shiva. Also, she knew about the Atma-Linga of Lord Shiva and the powers it could give his son. The Hindu gods attained immortality and invincibility by worshipping a divine Lingam called the Atma-Linga. 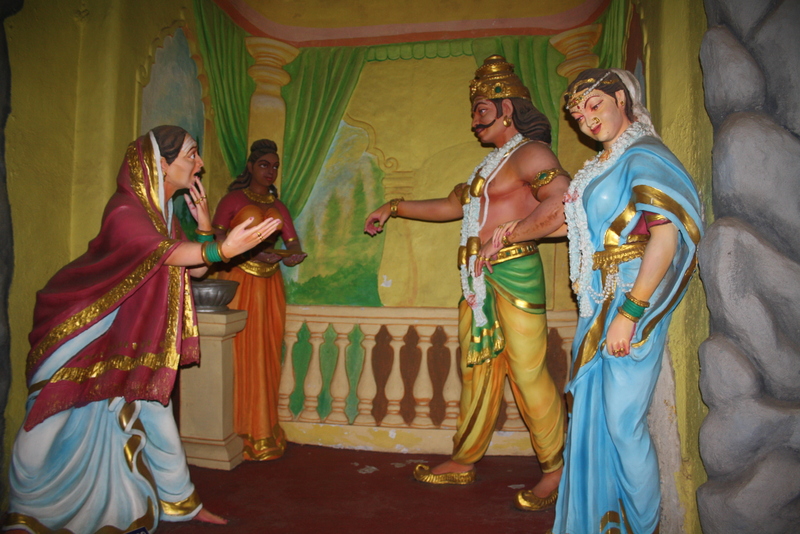 She convinced his son Ravana, to pray to Lord Shiva and attain the Atma Linga. By this time Narada had asked Lord Vishnu to change Ravana’s mind. By this time Narada had asked Lord Vishnu to change Ravana’s mind. 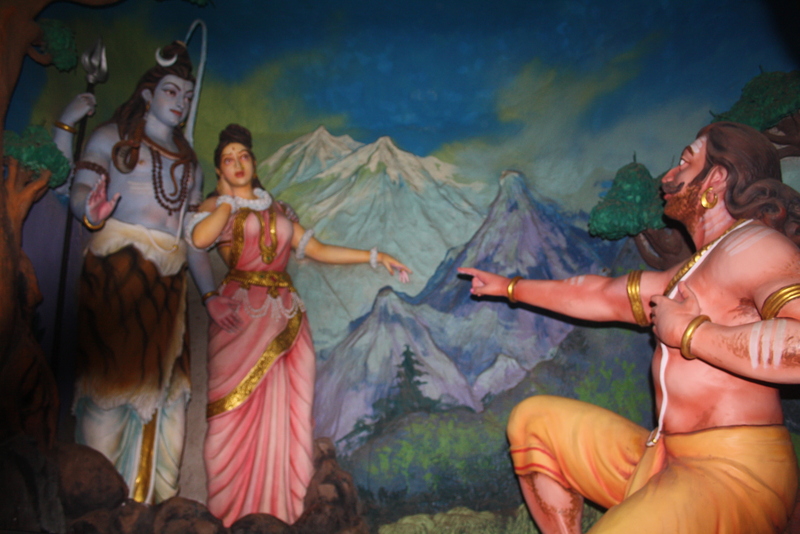 As a result of this plot, Ravana asks for Goddess Parvati, and Lord Shiva offers her to him. On his way back to Lanka Narada tells Ravana that Lord had not given him the real Parvathi and that the real Parvathi was in Pathala who was a King’s daughter in the world below the earth. 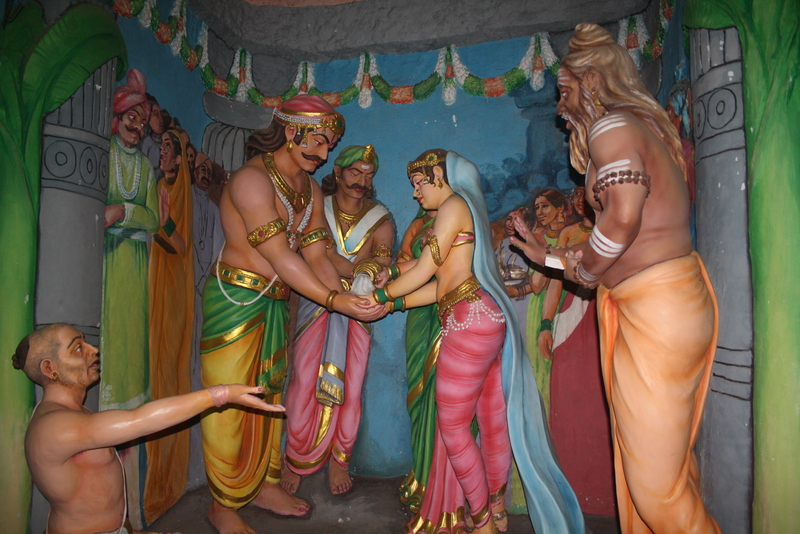 So Ravana frees his companion,goes to Pathala and marries a king’s daughter ,assuming her to be the real Parvathi. 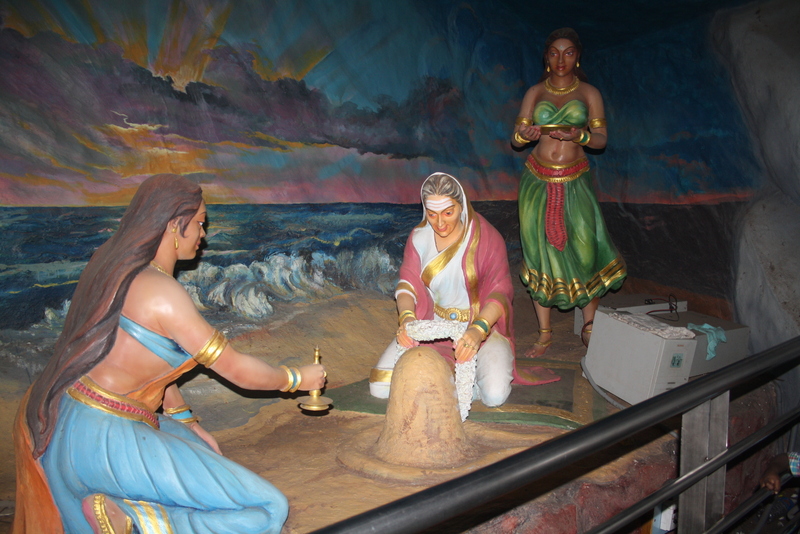 He then returns to Lanka, where his mother asks him for the Linga. 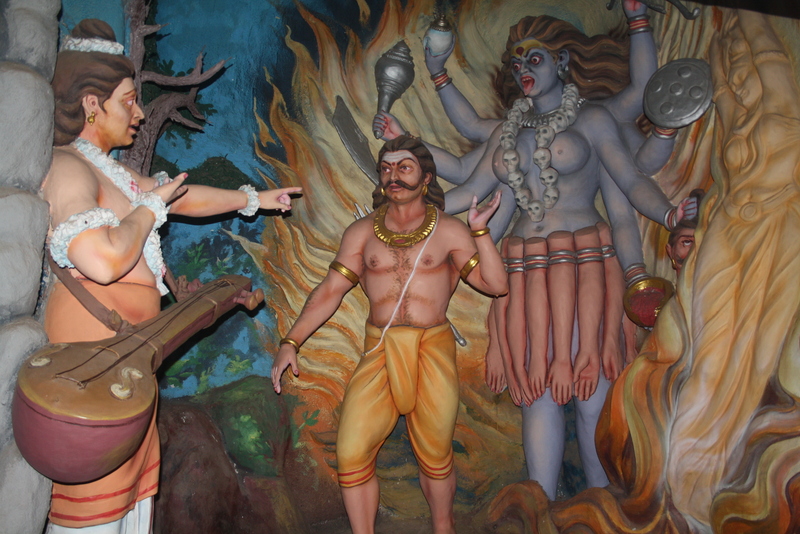 Ravana then comes to know of the tricks played on him by Lord Vishnu. 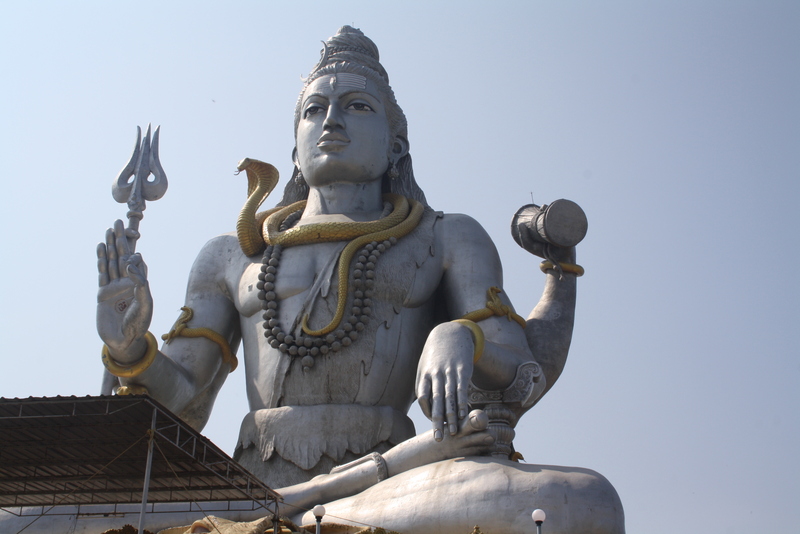 He therefore prays to Lord Shiva again, begging for his forgiveness. This time, it’s even more difficult to get Lord Shiva’s attention. He then decides to offer sacrifice by cutting his heads. Lord Shiva is moved by this dedication and restores his heads. 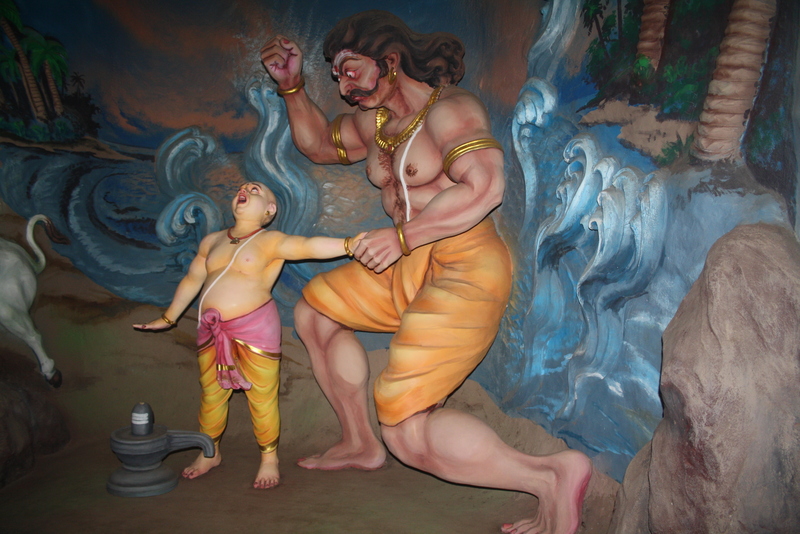 Also when he appears, Ravana requests the AtmaLinga as his boon. Lord Shiva agrees to give him the boon with the condition that it should never be placed on the ground. If the AtmaLinga was ever placed on the ground, all the powers would return to Lord Shiva again. Having obtained his boon, Ravana started back on his journey to Lanka. Sage Narada, who came to know of this incident, realised that with the AtmaLinga, Ravana may obtain immortality and create havoc on earth. 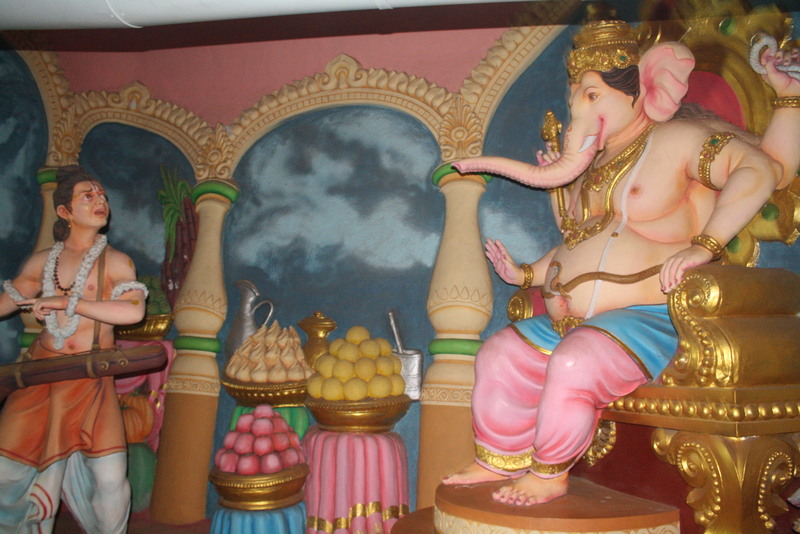 He approached the Lord Ganesh and requested him to prevent the AtmaLinga from reaching Lanka. Lord Ganesh knew that Ravana was a very devoted person who used to perform prayer ritual in the evening every day without fail. 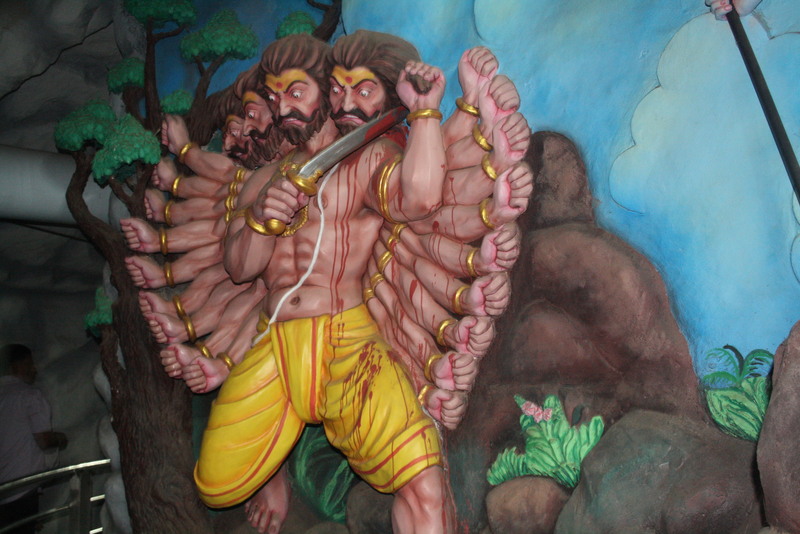 He decided to make use of this fact and came up with a plan to confiscate the AtmaLinga from Ravana. 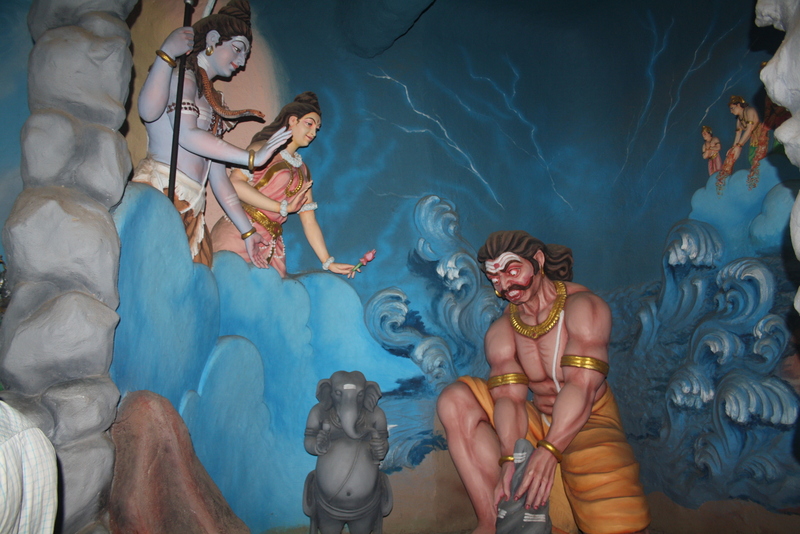 As Ravana was nearing Gokarna, Lord Vishnu blotted out the sun to give the appearance of dusk. Ravana now had to perform his evening rituals but was worried because with the AtmaLinga in his hands, he would not be able to do his rituals. At this time, Lord Ganesh in the disguise of a Brahmin boy accosted him. 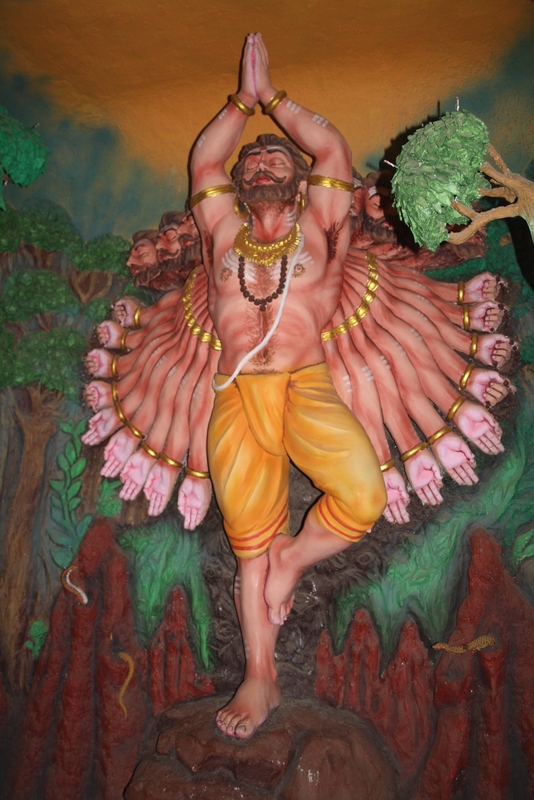 Ravana requested him to hold the AtmaLinga until he performed his rituals, and asked him not to place it on the ground. 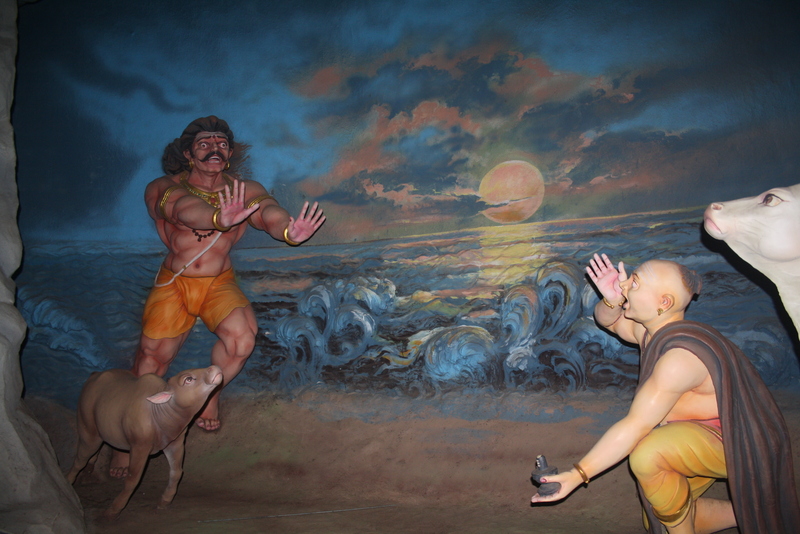 Ganesh struck a deal with him saying that he would call Ravana thrice, and if Ravana did not return within that time, he would place the AtmaLinga on the ground. As predicted, before Ravana could return after completing his rituals, Ganesh had already placed the AtmaLinga on the ground. Ravana got angry and in an enraged state, he hit Ganesha. Vishnu then removed his illusion and it was daylight again. Ravana, realising that he had been tricked, tried to uproot and destroy it. 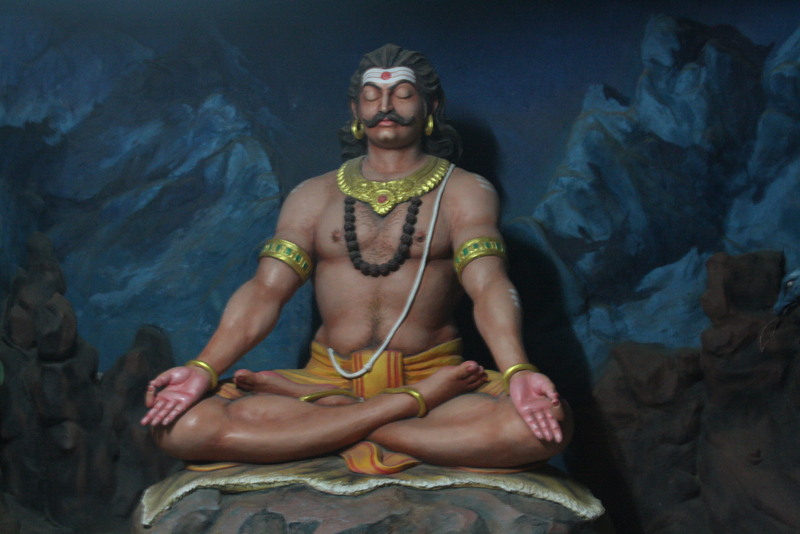 Due to the force exerted by Ravana, some pieces were scattered. One such piece from the head of the linga is said to have fallen in present day Surathkal. 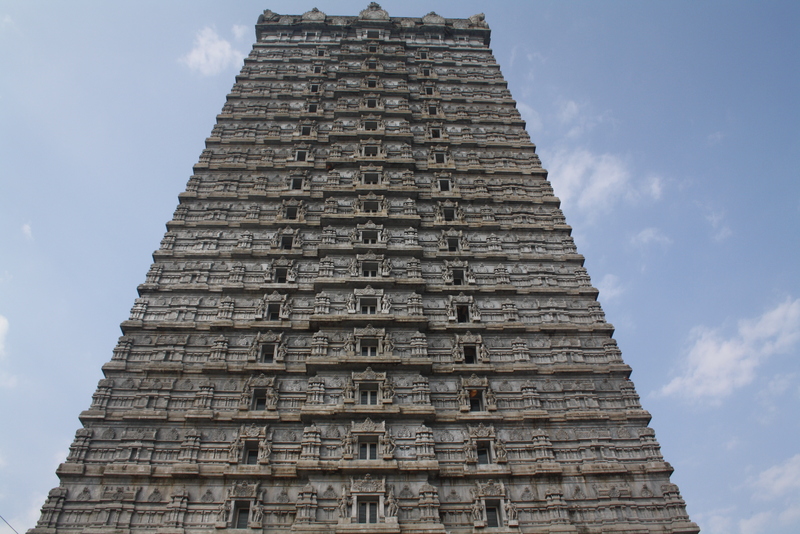 The famous Sadashiva temple is said to be built around that piece of linga. Then he decided to destroy the covering of the AtmaLinga, and threw the case covering it to a place called Sajjeshwara, 23 miles away. 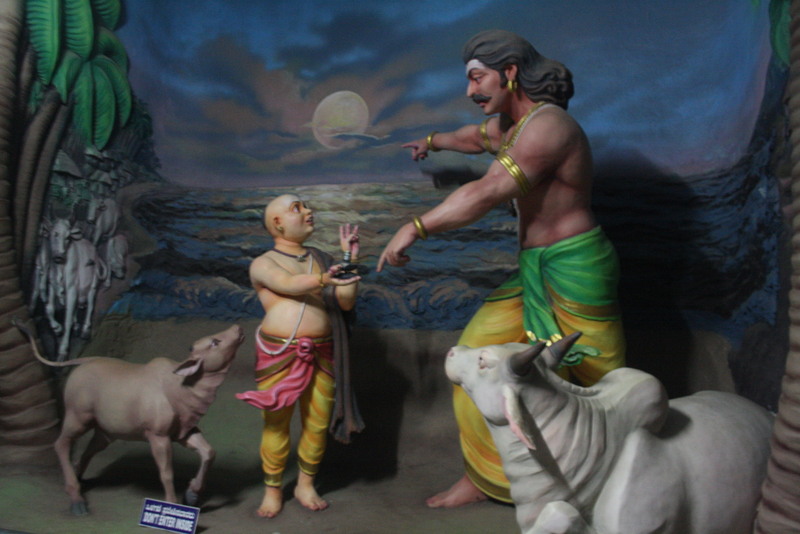 Then he threw the lid of the case to a placed called Guneshwara (now Gunavanthe) and Dhareshwara, 10–12 miles away. 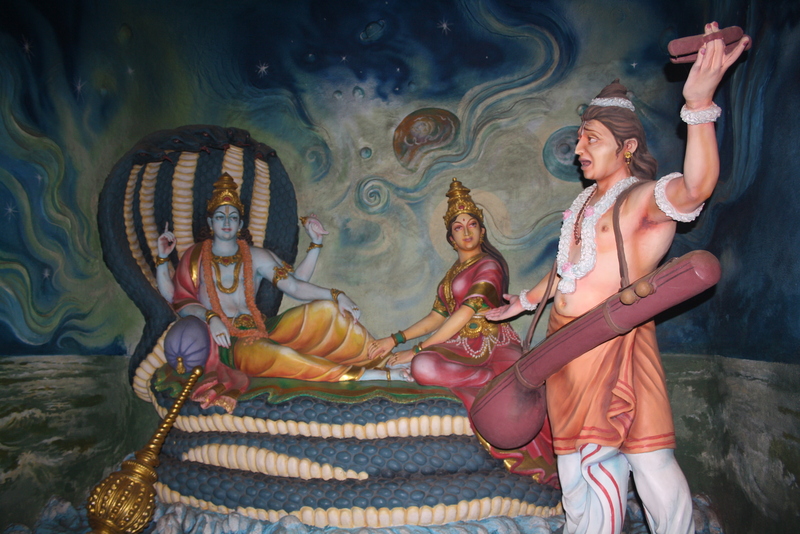 Finally, he threw the cloth covering the AtmaLinga to a placed called Mrideshwara in Kanduka-Giri (Kanduka Hill). Mrideshwara has been renamed to Murudeshwara. Quite enchanting and after having spent more than an entire day in this enchanting place, I returned to collect my backpack and take a bus to Bangalore… From there, my next stop was Sravanabelegola! Another ancient and yet very enchanting place full of beauty and history. This entry was posted in South and tagged Ancient India, Atma Linga, Ganesha, Gokarna, India, Indian Tours, Indian Trips, Karnataka, Linga, Lord Shiva, Murdeshwar, Murudeshwara, Narad, Nettrani islands, South India, Temples, Travel, Travel India, Vishnu on February 18, 2012 by srinistuff.